One woman shared with The Doctors that she is addicted to hot sauce and wanted to know if it could potentially cause problems later in life even though she doesn’t have any problems right now. Dr Drew Ordon said that spicy food releases endorphins, which give you a natural high in a way. He said it could also be a bad habit because you end up losing the taste of certain foods. Dr Travis Stork said the capsaicin is what gives the food its heat, and in some cases capsaicin can be an anti-inflammatory and boost your metabolism. It can also help you use less salt, so to him maybe a non-hot dish won’t taste quite as good, but if you’re eating your meals with a lot of spice, why not? Dr Jennifer Ashton said she learned that if you ever eat something that is so spicy it burns your tongue, a tablespoon of white table sugar right on the tongue will stop the burn. Dr Stork said when you look in the cupboard, think about less sodium and more spice. The Doctors then heard from a woman named Jenny who shared that she’s a police officer, so she’s required to pull her hair up into a bun above her color. Ten years ago, she had a beautiful full head of hair, but over the last five years, she’s noticed significant balding. When she goes out, she either wears a hat or pulls her sunglasses into her hairline, even at night, to cover up her thinning hair. She said she knows there are surgeries, pills, and creams that could help, but she has no idea where to start. To figure out what’s going on, The Doctors sent Jenny to celebrity hairstylist and trichologist Shann Christen. Jenny shared that she actually has naturally spirally curly hair, and spends a lot of time blow-drying, flat-ironing, and treating her hair to give it the straight appearance it has. Shann shared that he could tell Jenny’s scalp was very congested, saying that it should move around easier. Also, the hair was laying very flat to scalp, when could be caused by the overproduction of sebum, or natural hair oils. He applied some aromatherapy to relax the nerve and muscle that connects to the hair, and he already got much better movement in the scalp. He then pulled out 15 strands of hair, put it into some alcohol, and dehydrated it for ten minutes. He then put it into a reactive agent that would freeze the hair in time. Next, he moved it into a second reactive agent that would dye the keratin to analyze it. He then used a an enzyme mask to clean off the sebum buildup. He showed Jenny the analyzed photo of her hair, which revealed that it has sweat that dried onto her hair and scalp, and then turned into lactic acid to corrode the hair away. He also saw an example of sebum destruction that has completely eaten away the epithelial sheath. He said the keratin production is weak as well. He did a detoxification with more aromatherapy and then did a blowout. Jenny said her results are amazing, and Dr Ashton explained that she had what is called traction alopecia. She said the hair around the scalp is subject to loss and thinning because we’re pulling it back and drying it, and it’s a common problem. 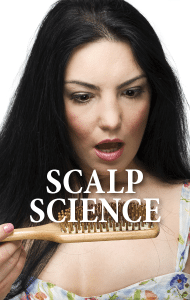 Shann said they came to the conclusion that the congestion in the scalp showed that her hair care habits were built on fallacy. He said Jenny’s hair was producing keratin, it was just producing it weakly. He also saw evidence of hormonal damage inside the scalp. Dr Ashton pointed out that Shann made his focus Jenny’s scalp, rather than her hair. Shann said now that Jenny is in such a damaged state, when she pulls her hair back into the ponytail for work, she’s been pulling it back wet, so it’s clean. But as the hair dries, it tightens down. Healthy hair will survive, but unhealthy hair won’t. Jenny said she now uses all-natural products and treats her scalp separate from her hair. She said before, she would blow dry her hair and end up with a handful of hair on the floor, and now she only had a couple strands afterward, because her hair is stronger. Shann said by replacing the minerals in the hair, she now has the ability to retain moisture and hydration. Dr Ashton said the life cycle of a hair follicle takes months, so you’re not going to see changes overnight. Jenny said she never knew there was a science behind hair care. Dr Stork said you can see a hair specialist to find out what tips and tricks you can implement you improve your hair quality.